[A Juju Adventure] Charming Lamp! It is time to continue with my blog series on demonstrating how Ubuntu is the best environment to write up “connected” or “cloud backend” Android Apps. As you might know, the Android SDK allows you to set up a sandboxed environment to develop Mobile apps in your desktop, using Juju you can do the same for Cloud apps. Today is time to set-up our own Cloud environment in a PC. A good starting point for a web application is a LAMP stack. If you hope for you service to get popular, you might want to split out the database service and the web service into their own instances so they can be scaled easily. When I set out to do this, I wanted to write an extremely simple PHP page that would expose a data table from a Mysql server. I looked up the available charms on the store. I found that you had a lot of charms for existing apps, but none that had the bare bones of a LAMP stack and just allowed you to install your own web pages. However, I did find a charm to deploy Mysql and a very handy tool to manage it (phpmyadmin). Taking this as a starting point I developed a generic LAMP charm. The first thing the LAMP charm does is to install and configure a new instance with Apache and PHP5 in an LXC container. The new charm will then copy any files under /website inside the charm folder structure, into /var/www. It also allows you to specify a Bazaar branch. It will clone the branch into the webserver and copy the contents to /var/www. I keep my TODO application for this exercise here. 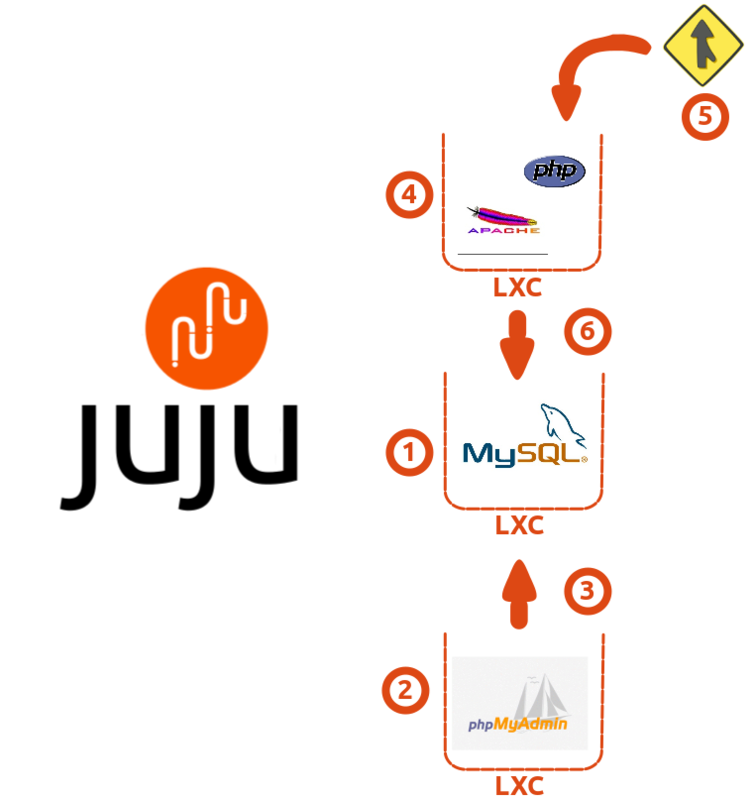 Using juju, you can set up a relationship with a Mysql service. A Mysql database is created by default at this time. You can change the name of the database as a configuration options. If you provide a file called mysql_config either on the /website folder or in the root of you Bazaar branch, this will be used to configure further the Mysql database. #step1 - deploy Mysql as a service. So there you are a full and scalable LAMP stack in your PC! With my web developer “hat” on, I can now hand this charm over to my Android app developer. They will be able to set up exactly the same environment locally to test their app without using expensive server time. So “Using a few charms from the charm store plus a custom one, set up a MySQL database that can be exposed through a web service with simple commands/steps” – DONE! Previous Post Ubuntu ARMv8.. ready for hardware bring up! wow, this is cool. especially the “add-relation” functionality. /var/www is created by apache, so the charm must be failing to install. Are you running it locally or ec2 or other? Are you using 12.04? If you are running it locally, I suggest you run juju debug-log in a different terminal and have a look for errors. Also, when you run juju status, is the lamp instance started? Thanks for the prompt reply. I pretty sure it start correctly — I destroyed the environment afterwards. Such is the power of Juju! Yep, running it locally on a brand new Dell XPS13 developer model. I will reinact the process through lunch and let you know how it goes. Thanks for your feedback. Been inundated at work, so haven’t got back to juju yet — seen your reply to my earlier post on Ask. Thanks for clarifying that. So best for me to put my App on Bazaar first, then SSH’ing in. Will let you know if any problems. Thanks for taking timeout to help me; really appreciate it.